I made these pillows for my kids on a sleepless night, using THIS tutorial from Cluck. Cluck. Sew. They turned out SOOOO cute! And the kids haven't stopped playing with them! Seriously, they keep these pillows with them at all times! I love it!! Bottled Rainbow - 2 blocks done!! Super Secret - WOWZA!! Folks - I am ecstatic to announce that the top is DONE, and I have finished quilting it!!! Yea! I was terrified at my quilting plan. It's all FMQ, with some really artsy moments. I was scared about doing it, but it really turned out great! I am done with the quilting and I am SO thrilled to KNOW that it will be finished by next week (the big day is May 12!!) So, obviously - the big reveal with be next week!!! Stay tuned! I am so proud of this monster! ;) Okay, here's a (very small) sneak peek!! Okay, not much a peek at all... Muahaha! Well, that's about all for this week! Happy WIP Wednesday! 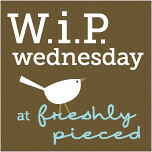 Be sure to check out the other amazing WIPs at Freshly Pieced!! Great projects! Your pillows are fantastic & I love your new bottled rainbows! Oh Linds I JUST LOVE these pillows, so so adorable! Your pillows are wonderful. They keep popping up everywhere, I may need to make some soon too! I made a sprocket pillow too last week , you could come over to my blog and check it out if you have the time!! OH i love those pillows - so fun! And your rainbow blocks are so beautiful. can't wait to see your secret project! I love your lime bottled rainbow. That should be a really colorful, fun quilt. Love the pillows! Adorable kids, too! I had the pleasure of looking back through your blog...it's full of happy, cheerful, beautiful thoughts and projects! That's not a peek! I can't wait to see your secret project. I know it will be beautiful! I'm still having trouble with FMQ. I can't decide if it's me or my mahcine. I like to think the latter. Your kids are so cute with their sprocket pillows! I think my son needs one too. The pillows are terrific and the fact that the kids love them makes the pillows even nicer. Can't wait to see this quilt. 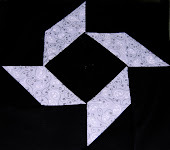 I am scared every time I just sit down to practice FMQ so I can imagine how you felt about doing that quilt. Glad it turned out great for you. Nice work! Can't wait to see your "secret" project! amazing pillows - you are very creative. so pleased i stumbled across your blog. inspiring! Looks like you have been having a fun time! I have sprocket pillows on my list too. I need to just jump in and make one! Can't wait to hear more about your secret project! those pillows are just adorable! I want to see that finished quilt unrolled! I love the pillows.. I want one.. guess I better try one later.can't wait to see the secret project. such fun pillows! After seeing that, I have to make some, too, for my little ones! These are so awesome. 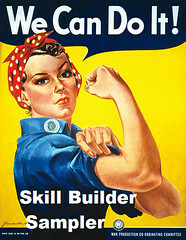 You are such an inspiration with all you are getting done! Congrats on finishing the super secret project. For some reason I couldn't get that post to load a minute ago.